My ‘coup de foudre’ re the performance scene at the Gold Coast at the moment is well documented (“Cultural Resurgence at Gold Coast”), so it was with great anticipation that I sailed down there recently to The Walls Gallery on Mountain View Road at Miami Beach to see a new showing, Now and Then, by Brisbane-based performance art ‘it-girls’ Clark Beaumont (Sarah Clark and Nicole Beaumont). The Walls is a reclaimed industrial space: intimate but with soaring verticals and surprising angles that make it a rich site for artists to play within. Clark Beaumont’s eerily mesmerising trilogy of installations is sensitively curated by Danni Zuvela (also co-artistic director of Liquid Architecture) and The Walls founder and Artistic Director Rebecca Ross. Kudos needs to be granted this dynamic team for showcasing the small but distinctive Gold Coast contemporary art scene. There was a buzz at the warmly hosted opening night and a sense of (at long last) cultural dialogue between Brisbane and the Gold Coast with QAG curators and luminaries mingling with the stalwart community of local artists and eccentrics drawn to the edgy energy of The Walls’ agenda. Drinking and gossiping in the driveway outside, we were able to step into the curtained hothouse (literally) of video pieces developed by the wunderkind female duo, to be engulfed by the cinematic aesthetic that dominates their video practice. The work that has put them on the map is their live performance art, most famously Coexisting at Kaldor Public Art Projects’ 13 Rooms in Sydney in 2013, where they co-inhabited a white plinth comfortable only for one body. The coltish elegance and fierce complicity of the two young women was arresting, inviting an oddly dispassionate gaze despite their relative youth and grace. This is the power of their collaborative force: they make us consider them through the prism of their friendship and cultural preoccupations rather than our own. Their video work seems to engage with a different DNA from their live art practice. It is a satirical and filmic discourse, with moments of snort-inducing, playful irony and cinematic deconstruction. Their first installation for The Walls was a revived work, Stay Up (2015), a circular screen about the size of a large television set showing looping film of a close-up of one artist’s mouth holding a fixed smile. It is the smile that film actors are taught to develop—unnaturally wide, that shows both teeth and gums—horse-trading to signify health and status, but achingly uncomfortable to sustain. 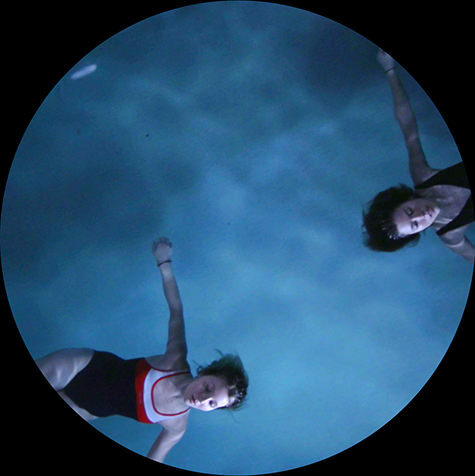 On a second circular screen, a short filmic sequence, Now and Then (2016), is underscored by ominous horror movie motifs, a recurring strategy Clark Beaumont employed in The Descent (2015) and prior video works. This time our view is a wide aerial shot of the two women floating gently but inexorably towards each other in a glinting, twilit pool. For The Walls they placed this screen above us, framed exquisitely between two timber beams that descend from the corrugated iron roof. This Hitchcockian sleight created a lush vertigo as we looked up at the screen to look down on these pale, floating bodies in their simple one-piece swimsuits. The two bodies collided ever so gently and docked within the curves of each other’s necks, merging into one splayed geometric floating body, a Kali-Hydra that eventually dis-entangled itself as the two bodies floated away. It was an eerie and disquieting work because of its restraint, another hallmark of Clark Beaumont’s collaboration. You kept waiting for the horror/shark/blood, but all you got was the dread. The final installation was nestled behind black curtains under the stairs that descend into the gallery. In a tight mid-shot the two performers, clad in gold lamé jumpsuits, roll between the walls of a carpeted corridor. Our view is dominated by their feet, their legs and the colliding flesh of their buttocks as they roll, grunt and recover from journeys across the floor between the wooden walls with their faded paint. Again, the soundscape cued the work and I laughed out loud with the pleasure aroused by the camp jumpsuits and clownish grunting. I felt that my journey through this small space had been oh so carefully constructed to offer a rich spectrum of associations and discomforts generated by a playful, narrative-drenched live art aesthetic from members of a rising generation of Australian performance artists.